Throughout the crisis, Eurogroup meetings that had Greece on their agenda have been awkward for Greek finance ministers and usually ended up with unpleasant outcomes. The minutes of last week’s Eurogroup leaked by the Greek business website Euro2day fully capture the uncomfortable experience which Euclid Tsakalotos had before he ended up leaving empty handed. After managing to secure the Parliament's vote for a package of further austerity measures worth around 2 percent of GDP in pensions cuts and tax hikes to meet the International Monetary Fund’s demands, he expected that the country’s lenders would honour their side of the bargain. This meant specifying the debt relief measures that would come into effect next summer and immediately securing the IMF’s seal of approval as far as sustainability is concerned. The debt discussion in the minutes broadly outlines the various positions and views around the table, which were already well-known. But it also reveals aspects that we were not familiar with and which hint at the direction matters will take from here, possibly outlining the outcome of next month’s Eurogroup. European Economic Affairs Commissioner Pierre Moscovici was the first to take the floor and his remarks suggest that over the next decades Greece will need to live with a primary surplus of 2 percent of GDP, which will keep it in line with the EU fiscal framework. 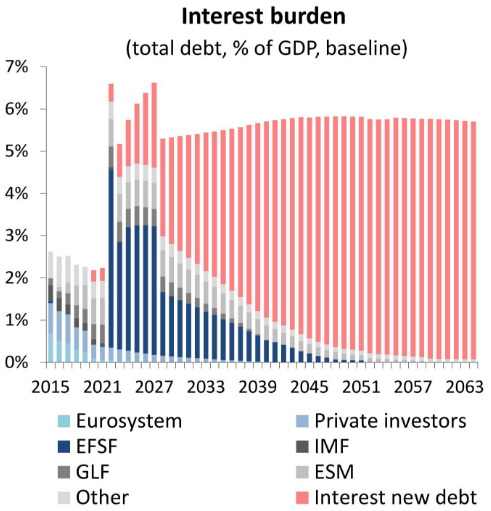 If in broad terms that framework implies a total deficit of 3 percent of GDP or lower, this translates into an assumption of an interest bill in the volume of 5 percent of GDP as market rates replace concessional lending terms from the EFSF and ESM. In terms of what was discussed about the potential debt relief measures, the only detail that came out of the discussion was when ESM head Klaus Regling referred to an interest payment deferral up to 2037. Considering that the current EFSF loan deferral expires in 2022 and sets out a rather steep need for debt servicing requirement, it seems that Greece’s lenders realise the need to clear that hurdle and push it further into the future. If this was the IMF assessment, after months of talks to work out a mutually acceptable outcome between eurozone lenders and the Fund, it does not bode well for an agreement in the coming weeks. If ever an irresistible force met an immovable object, that was the moment. The interventions of others did little to change the mood, not even when the Austrian finance minister challenged the IMF with a wager on whose projections on Greek growth will prove more accurate. Growth projections over the long-term proved a key point of contention as they determine the level of debt relief Greece will require. According to a paper that was prepared by the ESM with different macro and fiscal assumptions, a long-term growth rate close to the 1 percent which the IMF foresees leads to explosive debt dynamics and requires deep debt relief that nobody in the eurozone is willing to consider. 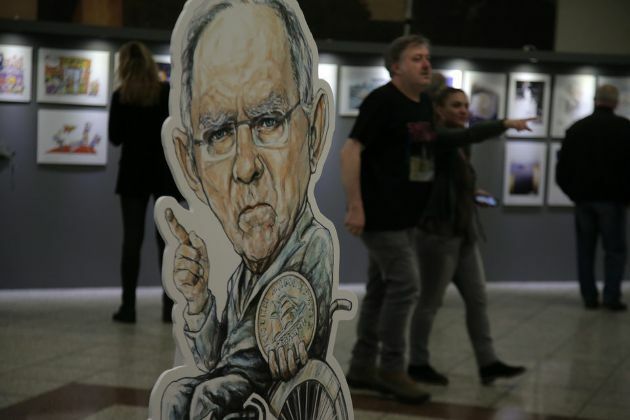 On Tuesday, Schaeuble said publicly in Germany that if the long-term growth prospects for Greece are as pessimistic as the IMF insists then all three Greek programmes were pointless. Tsakalotos must have felt ill-at-ease when Eurogroup president Jeroen Dijsselbloem proposed a solution that would go around the various constraints because this compromise entailed granting Greece its next bailout tranche but putting the debt relief discussion back. The Greek finance minister’s anxiety will have only grown when the IMF’s Thomsen argued that this is something that can be explored since the Fund has followed a similar approach in the past. This proposal was a world away from what Tsakalotos would have expected as the best-case scenario going into the meeting, but still seemed the most sensible suggestion given how far apart the views of the key players were. A four-hour break and various meetings on the sidelines only ended up with an offer that the Greek official had to refuse, as the narrative deployed during weeks of efforts to convince coalition MPs to approve a new austerity package in exchange for debt relief, leading to a virtuous path of access to QE and the markets, had just collapsed. Schaeuble’s closing remarks set the tone for the next weeks and the possible outcome of the next Eurogroup meeting. “I am not very optimistic that things will improve, that we will get a better solution than what we had at hand today,” he said. In other words neither the Troika nor the Quadriga are reliable partners. They string you along and never deliver.